Pernamobile Capps is a product of active action in arthritic pain, progressive pain, stiffness of limbs, inflamed joints, muscle spasms and others. Balanced blend with extracts of green-lipped mussel, boswellia, silicon derived from bamboo and MSM. Green-lipped mussel is only supplied from New Zealand, and the government is working hard to protect waters from pollution, unlike other seas and oceans. The raw material is carefully harvested from sustainable mussel colonies, ensuring healthy, sustainable growth with the best quality to get a clean product. - Glycosaminoglycans - the main component of connective tissue, helps to nourish the damaged cartilage and improves the elasticity of connective tissue. This mucopolysaccharide (MPS) is known by the name "glue of life" because of its ability to maintain healthy and flexible joints. 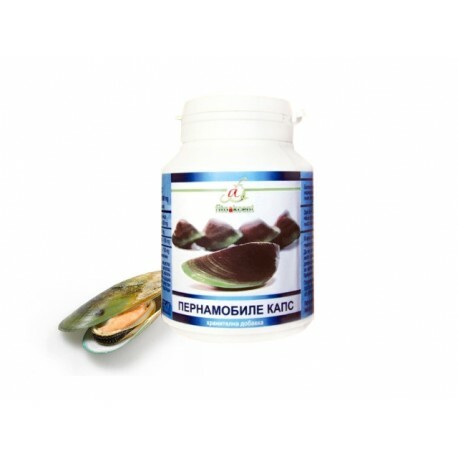 - Eicosa Tetra enolic acids (ETEA) is a powerful form of omega-3, exhibit strong anti-c-ca, which help to reduce swelling and pain associated with arthritic diseases. - Liprinol - another fatty acid contained in the ETEA, helping to control joint inflammation. 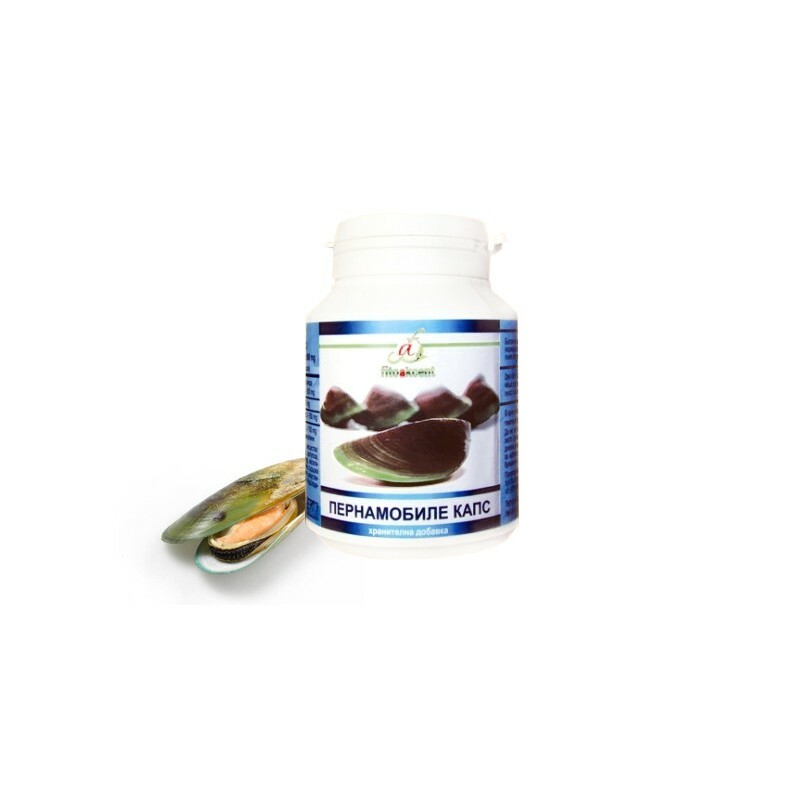 - Natural antioxidants - all marine lipids are good for health, but the most powerful antioxidant effects are those mussels as their main food is unicellular plankton containing them in large quantities. Along with protection from heart attack and stroke by protecting blood vessels. - The combination with a standard extract (65%) of the boswellia also a powerful antioxidant increases the anti-inflammatory amount of produkta. Active solids facilitate the blocking of the enzyme 5-lipoxygenase, and other enzymes responsible for the inflammatory process. - MSM (methylsulfonylmethane) - organic sulfur anti-inflammatory and analgesic action is involved in the synthesis of proteins in the formation of connective tissue, an important role in the formation of collagen, elastin that provide tone, strength, flexibility of the muscles, bones, joints, and skin, hair, nails and everything related to the degeneration of connective tissue. - Bamboo is the richest plant source of silica (SiO2) - 70%, in contrast horsetail that delivers only 5-7%. Imparts strength and elasticity of the connective tissue, and affects more than 50 diseases associated with its formation - bones, tendons, cartilage, joints, blood vessels and cells, gastrointestinal tract. Improves absorption of collagen, the proper distribution of calcium, protects against damage to blood vessels. SiO2 is antipyretic, antispasmodic and alkalizer body. Balanced formula that promotes normal functioning of the musculoskeletal system. Anti-caking agents: microcrystalline cellulose, silicon dioxide, gelatin capsule. No GMO! Twice daily 1 capsule after a meal with a glass of water. Много съм доволна от този продукт и вече втори път купувам от него. Имам намерение да купувам постоянно .Наистина действа на ставите както е описанието.Благодаря на екипа на "Здравница" , че ме информира за новите продукти. Редовно купувам от техните продукти и съм много доволна.В момента ползвам екстракт от зеленоуста мида и чувствам действието му.Благодаря на "Здравница" ,че ме информира редовно за новите продукти.